Hello Everyone! Just a quick post to show everyone the lovely work done by the ladies at today's class. Thanks so much to Jill, Alison, Dani and Sue for a lovely day! I cannot believe that 6 hours flew by so fast! There are lots of photos in this post, but we had to share everyone's efforts. Here they are, hard at work! I was really worried as they kept going quiet! So, here are the lovely cards that they produced. Fabulous work ladies! This is Jill's card. Jill used Molly Bloom stamps and My Minds Eye 'Happy Go Lucky' - Lime Twist Papers. This is Sue's card. Like Jill, Sue used MME Lime Twist - Happy Go Lucky papers, but she teamed the papers with Gorjuss Girl stamps, and some lovely handmade paper that we found in the scraps box. ﻿This is Dani's card. Danni used the 'Mabel' Stella and Rose MME papers in lovely oranges and greens. These go so well with the Tatty Button stamps. And last, but by no means least is Alison's card. 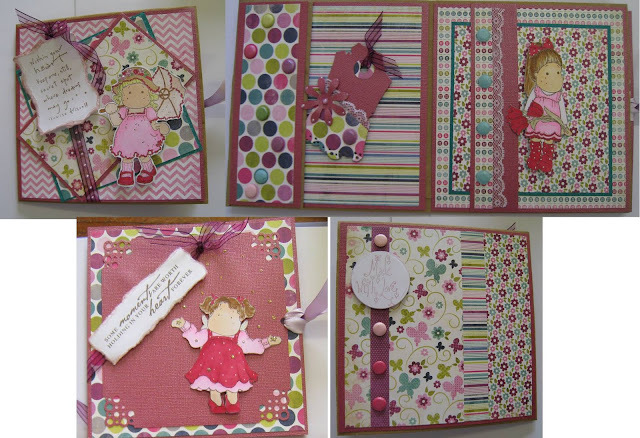 Alison has used the MME Lime Twist 'Happy Go Lucky' papers, and has used Magnolia stamps. They all look fab. Looks like a great class too.